If you are interested in checking out your fin options for your new SUP, then you will notice that you have some variety to choose from when it comes to SUP fin types. They differ in style, size and shape. Choosing the best stand up paddle board fin for your board will depend on the water conditions that you normally ride in and what style of paddleboarding you are most interested in doing with the board. To help you out, check out the different types of fins for your SUP as well as the placement tips for the best results out of those fin types. When you are on your board, do you want to stick with a straight line while paddling and really reduce any side-to-side instability? If so, a large single fin is a good choice for your SUP. Normally, this type of fin is between 8-10 inches in size. To get this result, just position the large SUP fin towards the tail of the board. This type of fin is secured to the board by placing in a finbox and then securing it with a nut and screw. The cool thing about the finbox is that it has has a channel for the fin where you can easily slide back and forth. With the tail positioning mentioned above, you are all set for touring, racing or flat water paddling because the fin position makes the board track better. For something different, slide that fin forward and position it at the nose of the board. This makes the board easier to turn, which is perfect for whitewater conditions and surfing. As you shop, you will notice that some of these large fins feature leading edges that are sharper or serrated, which are designed to cut their way through weeds and kelp. Depending on where you do your paddleboarding, this could be a great feature for you. Though first designed for surfing on a SUP, the 3-fin setup is also good for tracking on flat water. If you want to try the 3-fin setup, this is called “a thruster.” Normally, this type of fin setup features a 6-8 inch long center fin flanked by two smaller side fins. You can convert the thruster setup to a 2-fin setup just by removing the center fin. This leaves you with the two side fins, or “side bites.” This setup also works for surfing and tracking on flat water. With an inflatable stand up paddelboard, you often seen a 3-fin or 2-fin setup. Normally, the fins on an inflatable SUP are made of flexible rubber. In some instances, the inflatable stand up paddle board will have detachable semi-rigid fins that you can leave on or remove at any time. If you do some competitive standup paddleboarding, then you might want to look into adding some racing SUP fins to your board. Race fins come in several different styles, so you will need to decide which one will work best for you. You can go with a shape similar to the traditional surfboard flex fin, or you could opt for a board fin with a more rigid shape. Each has its advantages and disadvantages. The more rigid and stiff race fins are good if you have a longer board and you want something to help the SUP track easier in a rolling swell or large wind waves. The not so great thing about this style is that if you hit a rock or log with the fin, then you will definitely lose your footing and hit the water face-first. The more flexible race fins do not offer the downwind performance benefits of the stiff ones, but you do not have to worry about face-planting if you hit a log or rock. If you need a little help to visualize how to go about installing a fin in your SUP, check out the video below. Video: Installing the center fin and side fins on your stand up paddleboard. If you are using a single fin on your board, know that optimal placement really varies by board and rider. For paddleboarders who are new to using a fin, the most common thing to do is to place that single fin in the center of the box. Now, get on the board for a few sessions and see how that fin placement feels. Every so often adjust the fin placement by a quarter to half inch to see how your performance in the water changes. As you do this, you will easily get a feel for the best fin placement for your riding needs. Also keep in mind that adding the side bites to a single fin, which converts it to a 3-fin setup, gives you improved performance and control. For this type of SUP fin configuration the best place to start out your fin placement is with the leading edge of the center fin aligned with the trailing tips of the side bites, and move the center fin in 1/4″ increments until you find the sweet spot. 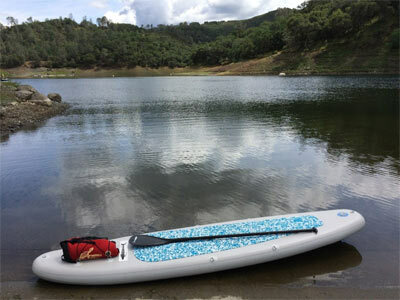 Know that the best stand up paddle boards come configured with a removable fin configuration that gives you the flexibility to install paddle board fins specific to your use, which can change from day to day. And if you’re still looking for the best SUP for your needs, check out our guide to choosing a stand up paddle board for beginners. I would like to ask if all iSUP – inflatable stand up paddles – have fins. And, if they dont have fins, from where can i order such equipment? You’ll have to read the specs for the iSUP you’re interested in to determine the number of fins that you get as it can vary by manufacturer. Most water sports retailers and outdoor outfitters (including places like Amazon.com) offer fins for purchase. So, if you’re interested in something like racing fins, you can search out those specifically.